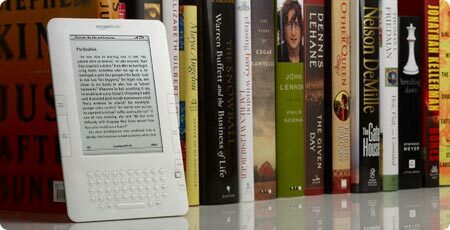 I am at conflict about Kindle versus book. Yes its greener and I do so love trees but I LOVE my books…I like seeing them on the shelf, I like the sound of pages turning, the smell of old books, etc. I do however like the idea of buying a book from the convenience of your home! I have a Sony e-reader and I love it madly. I love that it saves trees, and I love that I can buy a book in the middle of the night from my home. And I really love how easy it is to hold and flip pages. I love real books too, but more for their beauty. I love my Kindle too. While it contains only about 5% of my book collection, it still gives me a lot of choice in a very small footprint. I also love the free book downloads at Amazon each week. I love getting books for free!